It can often be forgotten by the greater public, brought up with the spectacle of cinematic wonders, that science fiction has a long and important literary history which predates the invention of the movies. 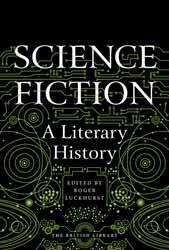 Science Fiction: A literary History (2017. 256 pages) is a collection of essays, edited by Roger Luckhurst, which examines the history of the genre. The book is a not dissimilar to Brian Aldiss’s Billion Year Spree (1973) and its updated Trillion Year Spree (1986), so why would we need another. Well, this book sets out to give a more expansive look at science fiction. Where the previous books had a predominantly American and European centric look at the genre, this book sets out to widen this scope to take in contributions from the rest of the world. Russia has particularly been poorly served by previous release, partly because books either never made it out of the old Soviet Union, or they didn’t see publication until many years had passed. The book opens with a small preface by Adam Roberts and an introduction by Roger Luckhurst, who tackles the thorny problem as to what exactly constitutes science fiction. As a genre it is not alone with this problem, both fantasy and horror also end up with nebulous definitions which are vocally contested between competing camps. The truth, as Luckhurst points out, is that science fiction is more like a river delta with many and varied tributaries. I personally do not consider Star Wars as science fiction, regardless that it happens in space, but rather science fantasy, but there are many who would disagree. There lays the problem that definitions can be counterproductive, creating restrictions where none need be made. The book consists of eight chapters, each a long piece of work and they are presented in roughly chronological order. That said, each is written by a different author so there is the occasional cross fertilisation. Each chapter is provided with extensive references. The book does come with one caveat. The object of the book is not to produce a list of the most popular, nor even what the reader thinks are the best science fiction stories. Many authors, like James Blish, will be given only a passing mention, but this does mean that the book will also contain many authors you have yet to discover. The book concentrates on movements and developments in science fiction. Science fiction has often either reflected the times when it was created. H. G. Well’s wrote about the horrors of total war, before the outbreak of World War I. Others have picked up on a more hopeful tone of man’s ingenuity to overcome anything, whilst others have reflected on the danger of the ever present nuclear bomb. Some, of course, are written for the pleasure of pure escapism. All these aspects come under examinations to give a story of a vibrant, ever evolving and restless form of story writing. Ultimately, the book is an eminently readable thoughtful examination of science fiction as a literacy art form. The book also contains some nice plates reproducing both book and magazine covers.